The past few decades have shown an increasing progress towards business role in social and environmental concerns other than business as usual. Such corporate social responsibility role became an important tool for corporate success and inclusive development all over the world despite it emerged in advanced countries. To that end, learning business organizations strive to erudite sustainability practices to meet the interests of stakeholders. 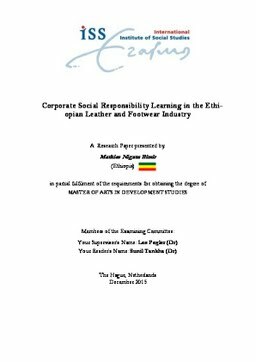 Applying organizational learning concepts and norm life cycle theory, this study was carried out to investigate CSR learning in the leather and footwear firms of Ethiopia. The study was carried out as a qualitative case study, informed by the selected leather and footwear firms, industry association and leather industry development institute. Interviews and content analysis of policy/regulatory documents were the main methods employed. The firms and the state were at the centre of the analysis. The issue of analysis was empirical CSR practice and how regulative, normative and strategic motives shape firms learning towards responsible business. Findings show that firms’ learning social responsibility is at emergence stage with the state and foreign market pressure as key motivators. While regulating environmental and labour conditions, the state offer incentives for higher economic responsibility of firms. Then, there exists collaborative learning in the firm-state institutions affinity. The civil society organizations are away from nurturing responsible investment and are not sources of social responsibility unlike advanced nations. Because firms see each other as rival, there is isolation which deter inter-firm learning too. Responsible investment, to move forward in the industry, needs multi-stakeholder dialogue and learning platform to share experiences and develop organizational learning.